Earlier this week, United Airlines denied boarding to a woman with a peacock that she claimed was an emotional support animal. The sensational story went viral and in response United announced increased requirements for bringing a service animal or emotional support animal aboard its flights. This is similar to the change in policy that Delta recently announced. Now, in order to bring a service or emotional support animal on a plane, the airlines are requiring increased documentation. People traveling with service or emotional support animals must provide proof of the need for the animal and if traveling on Delta, proof of training and vaccination. The documents must be submitted at least 48 hours in advance. This increases the burden on people who are actually disabled to make sure they have the necessary paperwork and submit it in a timely manner, or else they will not be able to fly. From sorting out logistics to strategizing to ensure our mobility devices are not damaged when flying, travel is already a hassle for many disabled people. The added tasks that need to be completed to fly with service or emotional support animals will make traveling even more difficult. It’s especially unfair that the increased restrictions will disproportionately affect disabled people, since nondisabled people are the ones causing this problem. People falsely claiming that their pets are service or emotional support animals have led to an increase in incidents of animal aggression and a growing skepticism among the public of the legitimacy of service and support animals in the first place. To understand the problem, you must first understand that service animals and emotional support animals are different things. Service animals (usually dogs, though mini-horses are also covered by the Americans with Disabilities Act [ADA]) are trained to perform specific services or tasks for a disabled person (including people with psychiatric disabilities). Emotional support animals are not specifically trained and are used to provide emotional comfort. There is no central governing body or accreditation agency that certifies animals as service animals or emotional support animals. 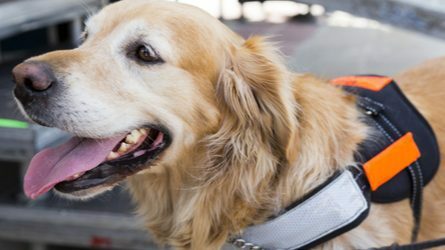 People can easily buy fake vests or other markers identifying their pet as a service dog online without having to furnish any proof of special training. Another part of the problem is that people conflate service animals and emotional support animals. Even legitimate emotional support animals do not necessarily need to be trained and can include peacocks. However, when airlines tighten their policies, the stricter standards are applied to both service animals and emotional support animals. The ADA does not apply to emotional support animals and only covers service animals. However, airlines are not governed by the ADA and instead have another somewhat similar set of regulations they need to abide by called the Air Carrier Access Act (ACAA). The ACAA gives airlines a wide berth to invoke rules when it comes to both emotional support animals and psychiatric service animals. Instead of making a distinction based on whether the animal is a service animal or an emotional support animal like under the ADA, the ACAA makes a distinction between whether the animal is primarily for psychological or physical needs. Airlines have never been required to allow non-traditional emotional support animals, like peacocks or snakes. Under the ACAA, airlines can also require advance documentation including doctors’ notes for emotional support animals and psychiatric service animals. If a restaurant were to invoke these kinds of rules it would violate the ADA, but the new restrictions that the airlines have added appear to comply with the ACAA, though that doesn’t mean they are not still harmful to disabled people–especially people with psychiatric disabilities who lose the most protections as compared to the ADA. It should not fall onto the shoulders of disabled people to fix a travel problem that nondisabled people have created. People who falsely claim that their pet is a service or emotional support animal are causing real issues for those of us with disabilities by making situations with already limited accessibility like air travel even more difficult for the disability community to access. I for one have been traveling recently with my mobility assistance dog. With these new changes, it has sent me into a panic several times. All this talk started when I was out of state, traveling, and I was relieved to know, this wont take place until March, however, Most of use who are disabled, are on very limited incomes. So now, I’m to spend more money to get my dog check out prior to flying by a vet. I know Delta wants proof of rabies and DHLPP.. but.. I give my own DHLPP, and I do that every few years, as per the Vets are now recommending. Also, in the area I live in, Rabies is good for 3 years, not yearly. I do not want to risk the health of my dog, by over vaccinating him. Why should I have to jump through even more hoops to fly with my dog then those who do not need medical equipment? Thank you to those of you who fake a service dog, or have untrained or unstable emotional support animals. You’ve not made my life easier, but much harder. Imagine how you would feel if you had to have your car checked out and inspected every time you drove it. and had to pay for it. And honestly, fake service dogs dont just harm our flight situation, but even day to day situations when we use our “medical equipment dogs” to manage stores, restaurants and anything else public. You may think that the act of you taking in your personal pet, and claiming it as a service dog so you dont have to leave it behind effects no one else.. but it does. It is a domino effect.. and all of use, with service animals, feel it. Again.. thank you. I think it’s almost like a Fake Service Dog Virus.. not much you can do for it.. but the effects spread like crazy. Exactly what Elaine Jordan said. Those of us who legitimately use service dogs are facing even more disparity and greater restrictions than non-disabled. Please allow us the same freedom and dignity non-disabled folks enjoy without thinking twice. Joan Stein, thank you also for your support! Maybe I’m missing something (I myself wheelchair-bound and face certain challenges went flying but the author seems to miss the point why I airlines are adding such requirements – it looks to be as if they are trying to reduce if not eliminate the problem of fake support/service animals – a problem which she acknowledges. The point is they are “punishing” the innocent along with the guilty and creating additional hardships for the disabled, mainly those with psychological disabilities. You, especially, should understand the additional hardships this requires. What if you were required to have your wheelchair checked out EVERY time you fly, 48 hours ahead of flight time, by a safety expert. Would you like to be asked, EVERY time you fly, to be singled out and produce a letter from your doctor, stating that you actually NEED that wheelchair? The airlines already have the right to refuse and remove people and animals that they feel might interfere with the safety of other passengers. Why don’t they use the LAWS in place, rather than create /stretch the laws already in place? This is an excellent piece and accurately depicts the burden cheaters place on people with legitimate needs for assistance animals.